Put down the bottled sauces and leave the prepackaged stir fry blends in the freezer. Good stir fry doesn’t need any of that. Even better, stir fry can be reasonably quick, but it does require some planning. With chop sticks in hand, some poor soul is about to take her first bite of an insipid, salty, messy something masquerading as stir fry. What should be a bright, fresh, healthy stir fry has instead been warped into an oily, salty, tasteless mess. Put down the bottled sauces and leave the prepackaged stir fry blends in the freezer. Good stir fry doesn’t need any of that. Even better, stir fry can be reasonably quick, but it does require some planning. If you plan right, the time from “Hey, let’s make stir fry” to eating stir fry can be about 20 minutes, even with all the work and the ingredients. 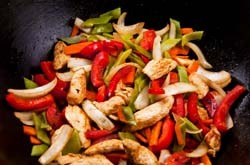 This stir fry recipe is a unique blend of flavors from the sweetness of the orange, chicken, ginger and red bell pepper to the spiciness of garlic to the earthiness of the basil and cabbage. Of course, like any good stir fry, this recipe is merely a template. The key is to learn the process! For instance, no orange? Add lemon, lime, or leave it out. Don’t have the vegetables listed below? Fine! Add what you do have, but whatever you do, cut them in the same sized pieces. If you don’t, they won’t cook evenly. The most important thing to remember is that you must have everything ready to go before you cook. Once you start stir frying, there’s no turning back. So, before you start cooking, mix the arrowroot with one tablespoon of water and set aside. In a separate bowl, mix the juice and zest with the broth, soy sauce, and sugar. Start a saucepan of well-salted water boiling and drop the noodles. Remove them after about 3 minutes and set aside. Now, let’s get to stir frying. Put your wok on high heat and let it get very, very hot. Chinese restaurants use special wok burners that put out half again as much heat as the gas burner in most home kitchens. Unless you want to install your own wok burner, just let your wok get really hot. Add the vegetable oil and let it heat for 30 seconds or until the oil starts to smoke. Add the garlic and ginger and constantly move it around the wok with a metal spatula. After 10 seconds, add the chicken and cook it until it is done all the way through, moving it constantly. This should take 6-8 minutes. Take the chicken out of the wok. Add the bell pepper, napa cabbage, and onion. Stir fry them until they start to turn soft, but still have a bite to them, again by moving them constantly. This will take about 4-6 minutes. Put the chicken back in the wok and add the juice/broth/soy sauce mixture. Bring it to a boil. Stir the arrowroot/water mix one last time (arrowroot has a tendency to settle) and pour that in the wok. Stir until the sauce thickens, which should be about 30 seconds. The stir fry is now ready to go. Serve on top of the noodles and garnish with peanuts.